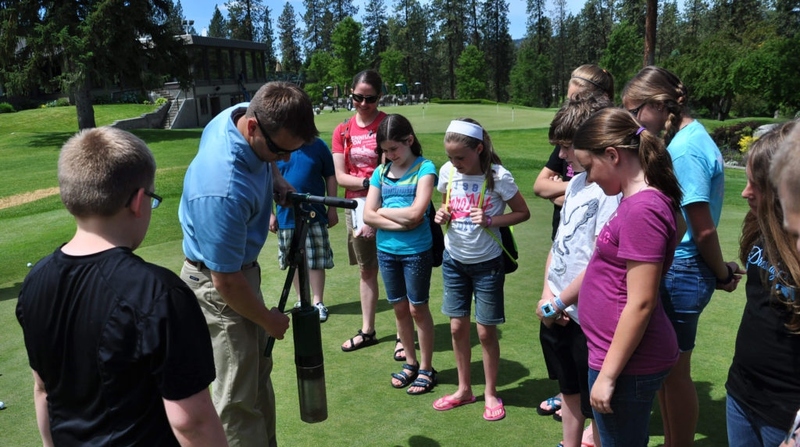 Below are field trip ideas for wonderful activities on your golf course. What might you have on your course to share? First Green also has other lesson plans with step-by-step instructions. Walking tour of unique areas of your course. Discuss interesting aspects of water features/streams, forested area/trails, other with kids. Have a short lab at each area. Native walk. Name the trees, shrubs, and low growers. Show flowers, berries (edible ones), cones, bark that might be unique. What conditions does the plant material like? Discuss the height they grow. Have pictures if they are not flowering or have berries at the time of your field trip. Salmon habitat and streams. Discuss salmon and when they come back to spawn. Show pictures. Talk about what they need in the riparian areas to let them rest and get shade. Why might the water be shallow? Talk about their life cycle, and how long it takes them to return to that very stream to lay their eggs. Wetland areas. What plant material grows there? What wildlife lives in or nearby the wetland? (Egrets and cranes, frogs, fish and water snakes.) Show pictures if you won’t be able to see them. What kind of soil might be at the bottom of the very wet area? Tree snags for eagle or falcon. Why are snags so high? What do the birds eat? What do they hunt for? Show pictures of birds and the size of their talons. Snags and dead trees are used as nurseries for their young and being able to see their prey at a high vantage point. Geological features on your course. Hillsides/slopes? Water run off? Stream formations? What was the course was built on? Small water falls? Boggy areas and soil? Dry/ rocky areas? Golf courses as nature preserves. Talk about how golf courses are more than places to hit tiny balls. They provide: refuge for animals, natural habitats for birds, clean streams and ponds, insect populations, and natural vegetative areas. Golf courses clean the air and filter water runoff from areas surrounding it. They can be green spaces in the middle of the city. Ask an Expert! Invite your golf pro, your chef, your GM, and your equipment manager to give a short talk on what they do on a golf course. Talk about what a superintendent does every day. Owl habitats. Show the inside of a nest, if possible (poop, bones, etc.). Talk about owls’ schedules of sleeping, eyes, talons, etc. Show pictures of owls you might have on your course. The great pollinators! Create a hummingbird or butterfly garden. Talk about why they are attracted to certain plants. Have plants ready for students to place and dig into the newly-prepared soil. Show pictures of hummingbirds and butterflies. Show pictures of the flowers of the plants you have selected. Talk about mason bees and how they help with pollination, and how important it is for our fruiting crops and flowers. Show them a mason bee house. Lizards, alligators, javelinas or snakes! Show pictures of what you might have on the course. Where do they hide or roam? What do they eat? How big do they get? Do they interrupt the golfers? Study of fungi, moss. Show real examples of each. What are their needs to survive? What environment is best or worst for them? How do they spread? Do they have a function? Let kids touch each one. Ask them if they have seen them and where. Seed lab. Show different sizes of grass seed. Ask kids how many might be in your hand. Let them feel the seeds and sizes. How many might it take to grow a 2” x 2” area? How much would it take to seed a green? What does it take to keep grass alive on a green? Show your machinery! Bring out several pieces of machinery, such as a roller, a fairway or greens mower, a core aerator, a utility vehicle — anything kids can sit on. Talk about what each one is used for. Have an assistant use the greens mower in front of them to see how it works. Bird houses. Do you have any bird houses in your trees to attract different birds? Show pictures of the birds that are using them. Consider bringing in a community birding group to walk your course and identify types of birds you have in the area. Ask them if they would be willing to teach kids about birds and the golf course environment that they live on. Pictures are great, too! Nutrients for turf. What is necessary for the grass to stay green? How are superintendents conscientious about the environment and careful about what they put down on the course? Keep it simple for younger kids , and ask them what they think their parents use at home. Show examples (pictures ) of bad turf and how you can fix it. Water conservation. What do you do every day to cut down on the amount of water you use? How does your irrigation work and how long do you keep it on? Have a student or two turn on your remote system. Perhaps bring out some PVC pipe so they understand how the water gets to each sprinkler head. Show them the irrigation station and explain how it works. Talk to them about wasting water (turn off water when washing dishes or brushing their teeth), and washing the car on the grass, not the driveway, to protect nearby streams from the oily suds) and how careful you are at the course. Build a green. Talk about the construction of a golf green. Why is it built the way it is? Show examples. Using plastic tubs, have grouped kids build a green using pea gravel, PVC pipe, sand and turf . How would they built a baseball or a soccer field, and what is important when building it?